Experience God in new ways with this self-paced devotion al reading Bible. 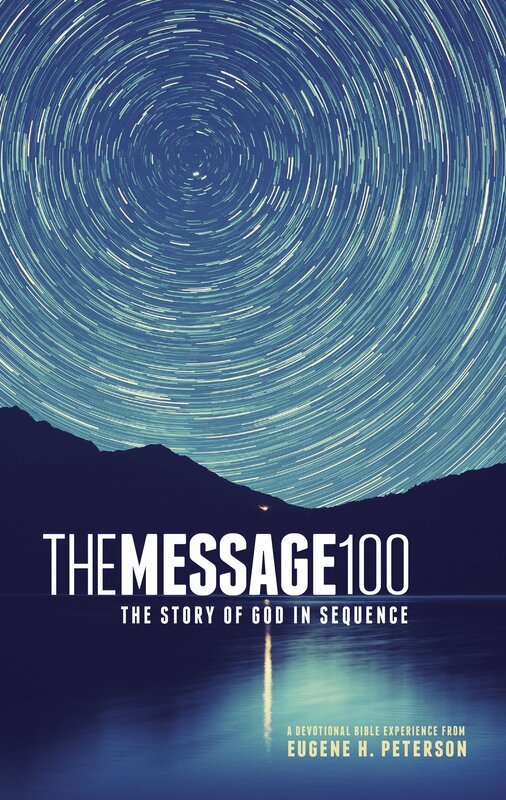 Here in the Message 100 is the whole Bible–every single, moving word of it–laid out in 100 readings and arranged to reflect the unfolding story. Move through it at your own pace, and discover how God may be moving right there on the page, right here in your life. The Bible was written over a period of 1,500 years. Now, with The Message 100, read the entire Bible in an order that reflects the unfolding of God&rsquo;s story. Through 100 readings, you&rsquo;ll see the face of God become clearer, providing a reading experience unlike any other chronological Bible. With today&rsquo;s hurried lifestyle, The Message 100 is a devotional reading experience that helps you slow down. Each reading begins with a brief overview, connecting you in to God&rsquo;s sweeping story. And the readings are long enough for you to become immersed in the story. Complete a reading in one sitting or break it up to allow time for reflection and prayer. God&rsquo;s word will come alive in The Message 100, and offer you something fresh and unique. The Message 100 is a reading Bible translated from the original Greek and Hebrew Scriptures by Eugene Peterson. Thoroughly reviewed and approved by twenty biblical scholars, The Message combines the authority of God&rsquo;s Word with the cadence and energy of conversational English. The Message 100 is a paraphrase of the Bible. Actual text from the Bible is not used, but rather a modern day style of the text and language is used to convey the Bible in Peterson’s own words. The intent of The Message 100 is to bring a more interesting and deeper understanding of the Bible’s content to those readers who may have some difficulty in grasping the Bible with a thirst and hunger from within themselves. The Message 100 is not meant to replace the Bible, but to be an enticement for readers to chase after the Bible once they have read the stories within The Message 100. I will admit, at first I could not put a grasp upon how to take in and read The Message 100. It is not the Bible and it is not really fiction, so what would it be. The only thing I could relate it to was watching a movie about the Bible, but in the form of text and not video. I have actually found it to be an interesting read. However, in no way does The Message 100 replace my daily reading of the Bible as it was actually written. I still cannot see The Message 100 as a Bible, but only as a story of the Bible. I recommend The Message 100 as a Bible storybook, but not as the Bible itself. I believe we are not to add or take away from God’s Word, so I am not comfortable with titling this as a Bible. It’s design is merely to ignite interest in a reader to pick up and read a Study Bible or actual Bible.